My job is to take the pulse of message boards, so let me tell you this: they are alive and kickin'. With so many to choose from, where should I start? Well, the NHL trade deadline is still a bit away and the NFL draft is out of our immediate reach, so I’m going to focus on college football for our initial voyage. National Letter of Intent day is only a few weeks away, and you know what that means: rampant speculation is being made on message boards regarding a number of future college football stars. That being said, I’d be remiss if I didn’t mention uber-recruit Terrelle Pryor in my first column. There's been plenty of speculation as to the future home of one of the most gifted athletes that this area has ever seen. --Personally, I’m tired of hearing/reading/seeing his name every time I go online, pick up the newspaper, or turn on the television. I think he's made it pretty clear that his intentions are to get the heck out of Pennsylvania, but some people just can’t take him at his word. Take ThatPittFan from the Pitt football board for example. This poster feels that since Mr. Everything used a Thomas Jefferson eye patch at the US Army All-American Bowl, Pitt is still in the running. Thomas Jefferson is the school that is sending Pitt Lucas Nix, who has been committed since the early part of this past summer. Nix also participated in the All-American Bowl alongside Pryor. Maybe ThatPittFan is clairvoyant and the eye patch really means something, or maybe Pryor just did this because he knew some knuckleheads in Pittsburgh would get worked up over it. My money is on the latter; my feelings are that this kid can’t get out of Western PA fast enough. 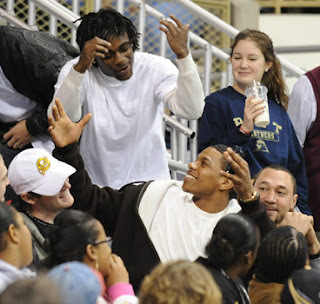 Of course, Pryor chose to go to the Pitt-Georgetown game on Monday night, as evidenced by this picture, so maybe the locals shouldn’t take him at his word. All DNA is different, by definition. There is nothing redundant about the 2 phrases "inherent" and "deoxyribonucleic acid". It was for emphasis, Einstein. That's not the discussion here. We're talking about the competency or lack thereof of the WVU coaching staff as it is being assembled. Do you have anything constructive to contribute, by any chance? The statement above was listed in this discussion on a Pitt football message board. Quotes like this are the reason that I waste my spare time on message boards. I have to think that Al Gore knew what message boards would evolve into when he invented the Internet. Here’s to hoping you find humor in this statement, because my column is going to emphasize the completely off the wall stuff that one can encounter when scouring anonymous discussion. Got a message board that just begs to be dissected? Read a ridiculous thread that everyone would enjoy? Hit me up at hotdog.zanzabar@gmail.com. You need to see the message board at Stillers.com.